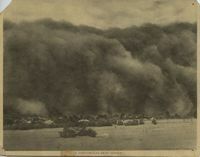 A photograph of a large dust storm at Narrandera on 2 February 1903, titled 'A Phenomenal Dust "Storm"', taken by Carl Dugdale, photographer at Narrandera. Photograph shows a large group of girls in the Murrumbidgee River taking part in 'The Learn to Swim' campaign at Wagga Wagga Beach. Photograph of the "Slippery Pole Competition" at the pool in the Murrumbidgee River behind St John's Anglican Church at Wagga Wagga. Won by GL Hanson. 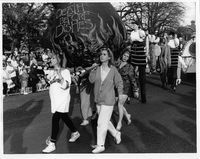 Wagga Wagga Teachers' College students in "A Midsummer Nights Dream." 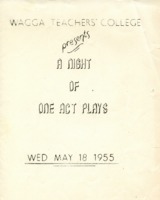 "A Night of One Act Plays"
This programme was made for the 1956 production, "A Night of One Act Plays," produced by the Wagga Wagga Teachers' College, in conjunction with the Wagga Wagga School of Arts. 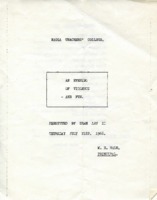 "An Evening of Violence and Fun"
This programme contains a list of cast members and production personnel involved in the 1966 WWTC Revue titled, "An Evening of Violence - and Fun." 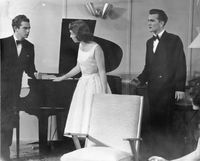 "As Long As They're Happy"
This programme for the 1958 WWTC student production of "As Long As They're Happy" contains a list of cast members and production personnel, as well as a short synopsis of scenes. Photograph of a man called "Bill". 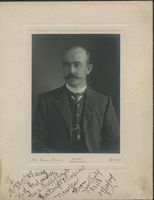 Bill has inscribed the photograph with the following: "To Mr and Mrs JW Edney. With best wishes for a Happy Xmas and a Bright and Prosperous New Year. From Yours Truly. Bill. 17/12/07." This programme for the 1955 WWTC student production, "Charley's Aunt" contains a list of cast members and production personnel, and a synopsis of the play. 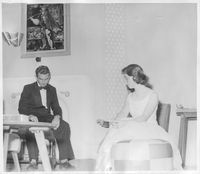 Wagga Wagga Teachers' College students in "Dangerous Corner." This programme for the 1958 WWTC student production of "Dangerous Corner" contains a list of cast members and production personnel. Wagga Wagga Teachers' College students in "Everything In The Garden."